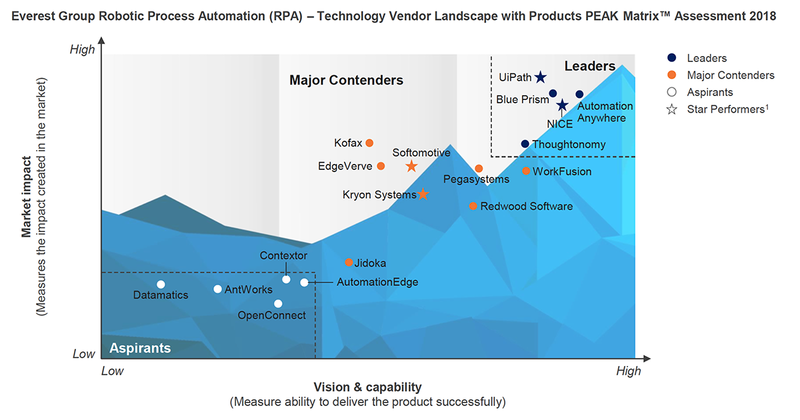 Following a year of record growth and having recently seen the fastest customer acquisition in the industry, UiPath has been named RPA Technology Leader and Star Performer in Everest Group’s 2018 RPA PEAK Matrix™, being the only vendor in the RPA industry to receive both distinctions two years in a row. Everest RPA PEAK Matrix™ is a yearly industry assessment providing analysis and insights on RPA vendors and products to assist enterprises in their selection processes. These findings reflect overall standards of quality for the RPA industry. UiPath is now the most widely adopted Enterprise RPA platform and the player with the highest market impact. The leadership position in the PEAK Matrix™ reinforces UiPath’s proven depth and breadth of coverage across customers, geographies, industries and automated processes.